Pat Conroy is one of those novelists that I’ve always intended to read, but never quite made time for. I read his memoir The Water Is Wide years ago, a book I can heartily recommend, but I never made time for his fiction until now. 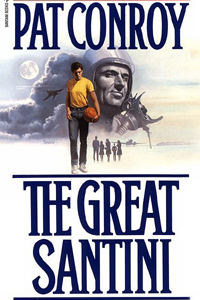 I saw the movie made of The Great Santini years ago. It’s a tour-de-force for Robert Duvall, who inhabits Marine pilot Bull Meecham perfectly, making him in turns terrifying, charismatic, and larger than life. It’s exactly as Conroy wrote him: the purest of Marines, living legend and sometimes embarrassment to the Corps, dedicated family man but bully and abuser to his relations. Bull runs on raw instinct, bravado, and Marine Corps tradition, and he has no doubt about how to act in any situation. Over the years, his wife and children have taken the fallout from his absolute rule, pressing the hair trigger of his temper, failing to live up to his expectations, or serving as verbal and sometimes physical punching bags when they or someone with power over Bull do anything to contradict his view of the world. What the movie doesn’t get as well, are all of the other characters. In particular, firstborn son Ben, Bull’s most frequent target except for his wife, Lillian, is just as important to the book as Bull himself. In many ways, the book is primarily about Ben’s coming of age and pursuing his own path despite Bull’s attempts to control him. Ben is a peacemaker, used to tolerating his father’s bluster and violence. His form of rebellion is to be kind and accepting where his father is bullying and never willing to admit wrongdoing. Over the course of the book, on the basketball court, in his interactions with the African-Americans of a small Georgia town, in school, and especially in his family, he learns that sometimes one has to do more than appease. Mother Lillian, a southern belle to the core, and oldest sister Mary Ann, a sarcastic, bright, and self-loathing girl, are memorable as well. The other thing that is memorable about The Great Santini is its depiction of a particular time and place (the 50s, 60s, and 70s) in the American South. It’s a kind of community that may not exist anymore, and that’s both a good and a bad thing. Although it may have passed out of existence, it’s a kind of place worth knowing and remembering, and through this book you can do that.